The law is: the parts go down and climb up, but the whole never climbs nor descends. On the basis of this law will come a day when the cells of the head will go down to the legs and the cells of the feet will get into the head. This can happen after thousands of years - is not important. In nature there is absolute equality. Even the highest cell can take the lowest service. And conversely: the most inferior cell can take the highest post. In nature, every job is important. The stomach, which deals with lower works, the first tries the goods of life. A lot of time has to pass, while the brain tries something these goods. 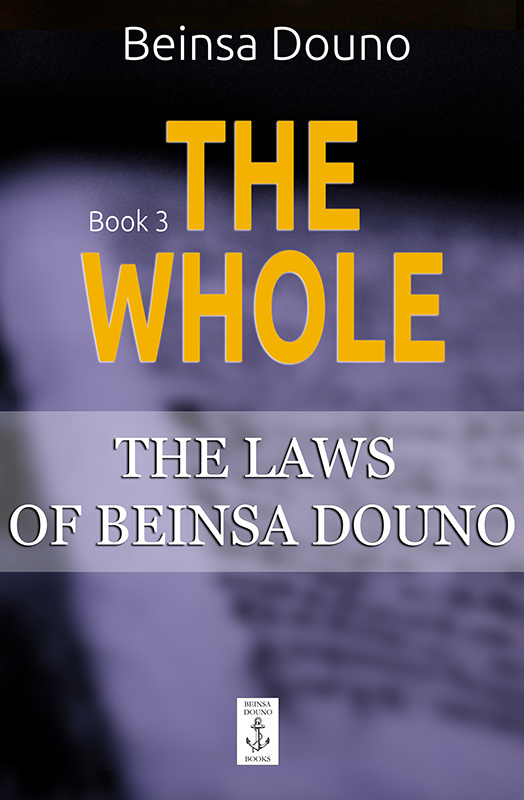 When talking about the parts of the whole, we run up two important laws. The first law is: part can never be greater than the whole, the whole can be always greater than any part and equal to the sum of all its parts. The second law is: any whole can be as small as the sum of its parts, but can never be less than them. The whole can never be less than its parts. Indivisible represents the smallest value in the world. Of the unit as an indivisible, there can be no smaller value. All the struggle of modern society lies in the fact that people want to come out of the whole. However, this is impossible. Each part has some impact. And when I say that in mind we are different from one another, I understand that the general intelligence that works in us, it is the same. But the mind of the whole cannot fit in its part. In the premier occult mathematics the part may be equal to the whole, but cannot be greater than the whole. This is one situation. The whole can be greater than the part. This is the second position. That is where the difference is. Here lies the great need that limits the parts and they must obey. This is an inner desire to be like the whole, but we cannot be greater than the whole. Therefore, each man must move within that whole. The law of nature is: the Divine always comes in multitude, but realized only in unity. In human comes just one wish, but realize a lot and therefore human life is meaningless, ie in human life there is no unity. In the Divine life there is unity, so then everything is harmonized together. However, to understand this thought a line of arguments is required. Man can not simultaneously be loved by the world and by God, if the world loves him, the invisible world will not be interested in him, if the invisible world is interested in him, the world will hate him. Why the invisible world is not interested in man when the world loves him? Because the world is wealth, the invisible world does not want to deprive man of that wealth, does not want to split in two his consciousness. Being connected to the world, it implies to work hard throughout the year and at the end of the year to see that everything is beaten, killed by hail or taken away by a flood. You look here – you look there, there is nothing: neither cabbage, nor onions, nor potatoes, or beans. You are wondering what to do. Only now you see that all that which on which you have relied, has been an illusion. There is a law in nature - the law of unity, one measure - unit, one reason – Initial Cause of things. In the law of the unity is and the law of many. In the unit of measurement are included all other measures. In the First Cause are hiding all the reasons. Real is what connects all of its parts in a whole. And when we talk about God as a principle, as Love, we understand what connects all living souls into a whole, without it be modified and changed. The law is: the great things get smaller and small grow and increase. Here, our universe is manifested in the way of shrinking and we study it in the path of growth. For example, initially the Sun has occupied huge space, but gradually the matter there has been thickening, while it has been formed in its present form and shape. Thus have been formed all the planets. Now we look at the universe with its suns and planets physically, externally, but if we look at it like a living body, like a living organism, we will have another idea. While viewing things physically, out of consciousness, the picture will be the one. The brain, the lungs, the stomach on the one side and the bones, the muscles – on he other, they do not have thoughts. They cannot think, but are dependent on the thoughts of the whole. There is something in man, which thinks; guides and keeps everything in order. This is a higher consciousness in man. It embraces the unconscious. While higher consciousness is in man, he is a living soul, grows and develops. Once this consciousness leaves him, he ceases to grow and collapses to countless particles. In nature there are two great laws, constant, common to all beings. One law is the law of absolute freedom, the other - the law of absolute limit. No one can avoid them. When man acts wisely, he is the law of freedom, no one can restrict him. When he acts unreasonably, he is in the law of limitation, where no one can help him. Why is that, do not ask. No one has answered the questions: why people are born and die, why they believe and do not believe, why they eat, why they rejoice and grieve. Many explanations are given to these questions, but no one can explain how the joy turns to sorrow, love - to hatred. But it cannot destroy the man. This is self-confidence. Thus comes up the idea that the whole cannot be decomposed into its components. It can only be exercised but not completely be decomposed to its parts. And man cannot decompose. He can only manifest and the parts manifest separately. Manifestation is in good and evil, and joining is in good and evil. I am not talking about chemical bonding, where the elements represent something different in properties than the whole. Two people, a man and a woman can be joined to make one work. To give sense to your earthly life you should disregard the current understandings. The part contains the properties and the powers of the whole. Higher ever is expressed through lower and lower ever serves as an expression of the highest. Christ has said to those who have believed: "If the foundations in my word, just as I tell you the truth, if you know the truth, the truth shall make you free." Under current conditions is required a science that stems from the truth, because truth is built on the whole space, all the great laws that now exist, all unchanging forms that exist in the world. The entire cosmos is built on the model of truth. You can not understand the celestial bodies, you can not understand their life; you can not understand the Earth, the plants, the Light, unless you know that internal law. You can read the books of human scientists, you will find in great contradiction: they believe that man sits higher than nature. In some aspects they are right. They take man for a deity, yes, but man is a manifestation of God. If man is a manifestation of nature, he does not sit above nature. However, in one respect, it sits slightly above him. It is because the word "nature" means the entity of all those sentient beings that work in the world. Then can man sit higher than all these sentient beings? Therefore, it is the reasonable in the world. I am not talking about that mechanical nature, to which you can pray and it would not listen, but about that nature, which is an echo of the Divine. I do not want to bring a split in your mind. I do not mean that there are no semitones. For example, you take an apple and divide it in 2 halves; the 2 halves you divide in another 2 - 4 are parts. Is the apple split? It is divided into four parts. Each part represents something whole, with the same properties of the whole apple. As you look at the orange, you see that nature has split it into several completely independent parts, which together form one whole. What is the difference between the parts and the whole? The whole is always greater than the part, the part may be equal to the whole, but in most cases it is smaller than the whole. Therefore Minor scale is part of the whole. Why? Because it is composed of many and it is coming down. The whole neither descends, nor climbs. Only the part can come down and climb up. Many ask: "Why many unworthy people the first try the goods of life and in such great abundance?" They are in the stomach of nature. "Why do they not give to us from these goods?" Do not seek to go down to them. Do not be seduced that some people enjoy the goods. They work in the stomach. When they have processed the food, they are sending it into the lungs, and hence to the head. Your food is finer; you will wait until they prepare it for you. I say: we must go back to those rules that nature has created. Light unit implies a germ that carries all in itself. The unit has, that can produce a plurality. The unit is generally a germ, which can produce a plurality. Plurality is a quality of the unit, the unit can multiply, plurality – can split. What we call "parts of the unit", these are countless particles contained in the unit. They are opportunities in which the whole evolves - it is a law of the human development. When we want to be bigger, we have to wish the unit to occur in its internal qualities, which are hidden in it. This unit becomes a whole tree. The unit is practical: after completing the whole process it shrinks. All its parts it shrinks to become available. It can increase as much as it wants and it can shrink as much as it wants. What increases is the entity. The unit is increased, so that the parts may occur. For if the unit does not increase, and the parts cannot occur. If it does not increase, and parts remain unchanged. "The righteous man walks in his integrity and his children are blessed after him." Righteous is the man who understands the ways of nature and exposes them, the one who never deviates from what he understands. Understanding I take in its fullness. There are understandings that are partial in the world - they are secondary. Primary understandings are those that have to do with the whole. One part can never take the place of the whole. It cannot replace the whole, therefore, according to this law every man in a whole is limited by the laws under which the whole acts. Sometimes people want to be free, absolutely free, without being restricted. They do not know they are part of a system, of an organism. They think they are free, but they do not know in what sits that freedom. Man who becomes poor, is he free? Man who gets sick, is he free? Man who loses his memory, is he free? Man who dies, is he free? And when it is said that man is free, he can do what he wants. Possible works - for whom? They are for God, for the perfect beings. These things are true for those who do not die, for those who do not impoverish, for those who do not get sick. But for those who die, for those who impoverish, these positions are not correct. Someone says: "I believe." You can have the faith of an ordinary man, but your faith dies with you. Your knowledge dies with you; your strength dies with you. We can transpose these laws and to God and to say: no creature can know more than God. And conversely: God can never know less than his parts – the living beings. Or in other words said: the Divine in man can never be more ignorant than the man himself. The Divine in man is his spirit into a higher world, and his mind is manifested in the physical world. When man decides to do something, man has to feel it and if his mind and his heart are convinced that the thought is right, then the will comes to realize it. So, the will does not occur without the mind without the heart. Engine of the will is the heart and the mind is guiding. Reasonable will manifests right human thought and right human feeling. Reasonableness and will go together. The highest manifestation of the mind is the reasonableness, and of the heart – the will. And understanding cannot be manifested without will. Without will and without understanding the mind cannot manifest. They are its organs. You will not contemplate with the mind of the public and with the mind of modern humans. It is a wrong mind, because it has stopped at a certain stage of its development. Modern thinking is the result of the entire human thought. It is because to think straight, we need to gather all the people of the world since the creation of the world, and those who will come in the future. This is the whole. And now we have a small part called society, but it does not constitute the whole. Theosophists suggest that there are about 60 billion human souls that make up the whole. And now on the Earth they are about 1 and a half billion, or the most 2 billion. So, in the invisible world there are more people that you do not take into account. And the disharmony, which is observed now, it is only in respect of our lives, and not in relation to the whole life. Do you think that when the whole is greater than the part it will allow any of its parts to play with it? It is unthinkable! At first people think they know a lot, they are all-powerful, so in their youth they become faithless, they trust more in their strength. As 45-50 years pass they become pious, and to their '80s all submit to God and believe in the invisible world. This is a weakness of the human mind. Man has originally been a unit - this is the basic law. Initially, the cosmic man, who has been called Adam Kadmon, before the fall has been a unit which has then been divided and of this division have been formed the human mind and the human heart. Thus has derived the number 2. By this differentiation begins the descent of the spirit. Therefore, the descent of the spirit means going away from God. You should explore the law of motion. Can you remember your departure, the first wish, which has put all other desires in motion? In your childhood, can you remember the first thought, the first request? You have forgotten it, right? The first wish, the first impulse of the child is breathing. With his birth, he begins to breathe, because the law of motion is the law of the astral world. So, the child is in a world that is not so harmonious. He is making a sound that determines that the environment in which he is located is not so nice - this means crying. Crying means that man is in an environment dissonant. But we will look at life, ie conscious life or self-conscious life, even as it is now evident. Each soul comes out of God to know itself. And it is the first movement in consciousness. To get to know itself, this means the infinite enters within limits or within the boundary, it defines itself. And each border creates forms, and each form contains within itself the direction of movement or path of evolution in which the ego or self has to go, or the human soul has to go to their improvement. Therefore the human soul descends to the Earth to become strong. Many ask: "Why does man cry?" I say: man cries, because he has touched a sacred place. He has touched without permission a sacred place of the tree of knowledge of good and evil. So the mother tells her child: "While you are in my womb, only I have a right to breathe. You will breathe through me. If you want to breathe alone, you have already pushed the sacred place of the tree of knowledge of good and evil and you should go out of heaven." That is the law. This law has application in all of nature. Only God has the right to breathe. We will breathe through him. However, dissatisfied with this situation, we want to become like God, therefore we touch the tree of knowledge of good and evil and we have to go out of heaven. If the soul is exposed directly to the action of the Spirit of God, it can not last. It will fade, as fades the gentle flower under the strong sunlight. It needs a soft, pleasant light. And the soul needs flesh as a cover, which to protect it from the strong rays of the Spirit. Who does not understand this law, scares of the flesh, of his personality, he wants to kill their lives. He thinks it is an obstacle to his spiritual development. To kill the life of the flesh and of the individual in yourself, it means to remove the conditions for the manifestation of the Divine, of your soul. This is the instrument on which the soul plays. What will the violinist do without a violin? How would he express the music that brings in him? Therefore, do not be afraid of the flesh and of your personality, but work hard with your mind to deal with all the negative, inferior and abnormal conditions. To strengthen your thought and work with it, this is the first task of the student. The law is: to live wisely, not to wish for. Do not desire what is foreign. Look for what is given to you. A book can be printed in thousands of copies. Do not take that copy that belongs to someone else. Get a copy that does not belong to anyone. Any wish that you wish for, it should be free. Go to the warehouse where the books are and buy a book that is set for you. In every store there is a book that people have set for you. In the world there is something that God has given to you. And you have to go find it. And "people" I call those who find what God has given to them. It is richly appointed something for everyone. So what is appointed for them! I look at this store all sorts of things God has allotted for you! You say: "To have someone to bring it here!" For you it is important to apply the following spiritual law: the good, which I give you to use it yourself. If I decide to take part, to share it with you, all is lost. Mother follows that law. When she does something for her child, she is reluctant to do so for herself. She is glad that her child will only use a certain good from her. It is unfortunate that not all the mothers follow this law. If they do not follow it, they destroy everything God has given to them. Do not aspire to be like me, and strive to be like yourself, this initial form that God has put in you. This law appears to be everywhere. Everyone should be master of his own mind, of his heart and of his will - not allowing people to have them. The Divine law states: everyone should dispose with himself, not to give himself under rent, ie in service of the others. Hence we derive the following law: man must not be a slave to anyone. Do not become slaves to your children! Every child that comes into your home has the main task to serve God. If so, you will accept him as God accepts him, you will watch him as a servant of God and you should not enslave him, nor the child should enslave you. Do not think that you can make your kids happy. Everyone, whether he is a scholar or simple, more or less capable, strong or weak, is sent to the Earth on a special mission that only he can do. Do not think that you can modify his task. Who for whatever is born, he will do it. This law is also applied to the human body. Every part of the human body performs a specific service. Whoever finds his place in nature and understand his purpose, he will properly fulfill his function as a part of the great Divine body. If I would have had a father, I would like him to be the most reasonable. And if I would have had a mother, I would like her to be the most noble. Greater wealth than that I cannot want. If I have it, I am able to deal with my life, find my way in life. Powerful forces sit hidden in the man himself. If you believe that there is a law of nature that you can check: if you know the language of nature, it may answer your, it may suggest you ways to settle your life, it can satisfy the needs of man for his daily bread, even the most essential needs, but it never meets the needs of people for money, wealth and variety of other minor works. For each man there is only one set way in which he has to go. However, for him there is a certain budget allocated by nature with which he may dispose. Since birth he has to know this path and not to deviate to one side or the other. For whatever a man is born in this area he should go and should not deviate on a iota from his path, he should not be tempted by anything. Everyone cannot be a doctor and every doctor cannot cure. To be successful in healing the doctor should have besides a diploma from the medical faculty, but also from living nature. This diploma he brings, thanks to the right combination of strength in his body and harmony between these forces and the rational nature. For such doctors we say that they are born doctors. Everyone is born to perform certain mission; each man has his own purpose. If he takes a job that nature has not determined to him, he may cause mischief not only to himself but and to those around, of all the mankind. These are people whom we call harmful to humanity. Among all the people there is an inner connection and when this connection is conscious, if they are happy and we are happy. Once we feel their joy, we feel and their grief. It is not bad that we feel the joy and sorrow of all people, but we must strive to live according to love. It is a great law that puts all living beings in the Divine organism on their place. Because the world is now converted, each of you has to go to his place. Love will put everyone in his place in order to be able to occur properly. So your consciousness has to be very alert. Each individual has a particular place. Once he falls into place, he is happy; he is growing and developing properly. Once he leaves the place, he becomes unhappy. This applies not only to humans, but also to all beings without exception. Therefore, stay in your place! If you displace someone you will get hurt. Where the happiness of one is, there the misfortune of another is. That is the law. Given you a place, keep it up! Everyone, as a part of the tree of life, should know his place and his time for developing. Keep in mind the thought: "I want to be exactly what God wants me to be." Once you are in the Divine world, you will seek the following law: you need to realize all that is determined by God. Everyone needs to understand why he has come. Run the program that is given to you and do not be afraid. Alone do not make any program, run your program, which is defined by nature and your life will run smoothly. Many stop at the idea what for they have been born on the Earth. According to me, this is ridiculous question. I am going to school to learn and ask why I have come. I have come to learn, of course. Now I want to stoop on what God has put in you. You are responsible for it. If you do not show it, you will suffer. From it you will create your future, your happiness, or create your unhappiness. Ever, when man does not follow the laws that God has set, he will suffer. Everyone has a specific service that he must fulfill in the world. And if he does not perform it suffering will come. At first each man must be true to that place where God has put him and not to out of it. Do not leave your seats! Do not think that in the world you can find a better place than what God has given you! Wherever you go, finally you will again go back to the same place where God has placed you. You can move, you can go far, but you have to return back to the place where God has placed you. For you are in service - will return. You say: "I am free!" You are not free. You are free outside of the office. They will call you to do any work. Your success depends on the work you do. If you do it right, it will go. If you do it bad, you will be unhappy. You do not need a lot of wealth, much knowledge you need. And the little that you have, you should know how to use it. One thing is required from man: to find the direction of his movement and in this direction to focus his energies. If man does not find the direction of his movement, he remains dissatisfied all his life. When they do not know this law, the parents often force their children to learn what is not on their heart. I say: in whatever direction to manifest the life of man, it is important to go in the direction of his consciousness. I it goes in this direction, the life of man manifests correctly. Thus, whatever works a man is doing, if it is helping his personal lift and if it is to the benefit of all mankind, it is noble. It is not enough only to know the reasons for the actions of people, but you need to know and those of the whole organic kingdom, because the same is the great law that regulates the whole organic kingdom. This law, this reality in the world is reasonable, except that all beings do not perceive the same. For instance the consciousness of plants is not as alert as in the animals; the consciousness of animals is not as alert as in humans. And finally the consciousness of all people is not equally awake. The consciousness of a farmer or a trader is not as awake as the consciousness of a scholar, a philosopher who is dealing with abstract issues. However, consciousness of that man - the philosopher is not so alert. This person may be a philosopher or a prominent scientist or a poet or a writer, but to have an alert consciousness, it should be a whole consciousness from the consciousness of poets, scientists people, philosophers, traders, farmers, and so etc. There is an internal law, a reasonable consciousness, which directs the consciousness of all the beings. This consciousness sets what the trader should be. You think that the classes that exist in the world are arbitrary. Not all classes that have existed for centuries are determined precisely by this great law. The trader, for example, is a carrier of a certain idea in nature. The writer, the poet or the scholar are still carriers of ideas known in nature. Each of them has his purpose. Everyone is a co-worker of nature. Whatever the service and to occupy, as small as it is, it definitely has its place. And if man has fulfilled his duty properly, he is considered honorable and noble. Remember that each of you has his path, as the Earth has, as the Moon has, as the stars have. Each has to go his own way, there is the salvation. The path that God has set for us, in it we should go! You sit and say: "It is not worth man to live." It is not worth to live with this understanding of life. If it is not worth, amend it. Once in a place you are not comfortable, change the place, go elsewhere. Once on a place you are not loved, go to another. Christ says: "Go to the other." Circulating around the Earth, you will find a place that God has given you. God has not sent you here. Here you have come due to certain karmic law. You are not yet for Bulgaria. Someone is an Englishman, but he is still not an Englishman. He has dressed himself karmically. If you go to England, you will see people who are not Englishmen. If you go to Germany, you will see people who are not for Germany. There is a confusion of races. Stop on what is given to you and which at that time you can make. There is a law that has been tested for thousands of years. This law is the following: Never allow a negative thought to prevail in your consciousness. By any means do not allow such a thing. Someone comes to you and says: "Do you know that your father has died?" Leave that thought aside. Another comes and says: "Do you know that this and that bank has collapsed?" Leave that thought aside. Another comes and says: "Do you know that you are fired?" Leave that thought aside. If you are really fired up, you should know that you are in a man's order. So, the people have employed you as a teacher, and they will fire you as a teacher. They have appointed you as a manager, and they will fire you as a manager. Or they have appointed you as a minister and they will fire you as a minister. However, from the point that you are put by nature, no one can fire you. The whole world to gather to fire you will not succeed. No one can dismiss that person from his work, to which nature has appointed him. This should come as a rule, as a law in your life. In this position you will be the master of the situation. Remember the following thing: it has not been time, and will not be, when someone has been fortunate to take the good that God has given to anyone else! There is not a single example where someone has been able to take the good from whomever. This is a great law. The life that God has given you, no one can take it from you. This is the law. Nobody can deprive you of your living conditions. But if you sin, if you once break the laws that God has set as the basis of life, you yourself is off and now all can be taken from you. The causes of all sufferings, miseries and hardships in life, are you alone. All people on the Earth are created to live at first just for themselves, then for others. This is the law. That all men live only for themselves we see from the fact that human individualism, human selfishness has been born. Individualism is born with the awakening of the consciousness of man that he is human. But this selfishness, that self-love, he has distorted, he has exceeded it. Therefore, when man says that he has to live only for himself, he should give this right and to the others to live only for themselves. That is where the law is. He is aware that he should live only for himself, but he is not aware that the others have to live only for themselves. "Why do we suffer?" If you want to know, you will call all the people with whom you are connected and together with them resolve the issue. Alone no one can resolve the question of sufferings. When a company made up of about 100 people wants to liquidate, all these 100 people should gather in one place and together decide the question, if the company should be liquidated or not. Therefore, there is a law in nature, which determines the relations between people; according to it man himself neither suffers, nor rejoice. You will get contact with all the great laws of God, when you stop thinking about yourself and your misfortunes. The law is such: if you from morning to night think only about yourself, you are being unorganized. When you begin to love God, when you think of your neighbor, you are already organized. Selfishness is unorganized idea. The highest peak in life is the personal feelings of man. When he gets to that peak, there will be a wide space. But this peak is the cause of all the misery, not all, but most stem from this peak. There, if you are not careful, you could fall and dislocate your feet. There is thick snow there, making big torrents, there are big storms. Some that gets to the top, go into great difficulties. Those who are at the foot of this peak, they must be away - even at the foot it is dangerous. Man must understand the laws of his personal feelings. Now I ask: if man has no personal feelings, would he be better? If no such peak, will it be better for man? That law on which to build your life is so simple and straightforward, that if you have walked all this way, things would not have been as difficult as they are now. You sit and think: "Why nature has not endowed me as the other people?" How do you know that you are not gifted? If all of you have been equally gifted, what would have happened to you? In diversity is precisely the point. You cannot find two men with the same abilities. There is a very subtle difference between people. The beauty of life is sitting in the great difference that exists between people. To give money to someone, this good anyone can make. If I give you 100 - 200 lev, that and everyone else can do it. I think good is what I can do and no one else can not do it. And what I can do, and another can do it, it is not good. Good is what you can do and no one else can do it. Thus is sitting the greatest law in the world. And this is the difference between all the reasonable people. The good, that they can do, no one else can do it. The thought that they design in the world, no one else can design it. By this they are special. Now everybody says: "We are one." If you do not have this feature, then you do not have to mention that in the world we are all one. One what? One in God, one in the whole, one in relation to the infinite, and not one to do, in how we manifest at a time. Just there is sitting the beauty of the world. Under the current conditions, can our Earth become like the Sun? It has no possibility to be like the Sun. As it is put in this system, it is impossible. Now the law that we must learn: every man is put in a certain system in space, in existence. But the Earth will remain Earth, Mars will remain in this size that it has. It may increase slightly, but unnoticed. The Earth cannot grow much. Let us say a country is increased by 20, 30, 40, 50, 100 kilometers. This is nothing. The diameter of the Earth is 12,000 km, and of the Sun is 800 million kilometers. Then you are put in a system, you look around and say: "I want to be like him king." You do not understand the proportions of this king. He belongs to another system, you like him cannot be. Once you can think, you can imagine that you are a king, but to be king ... Second Napoleon would not be born. You can only as an actor play Napoleon. Mental aspirations are not bad, moral aspirations, personal aspirations, social aspirations and instincts, they all are on place. It is not bad to be a strong man; it is not bad to have developed personal feelings, because if you do not have personal feelings, you will not have achievements. If you do not have social feelings, you will not have a place to store what you have taken. If you have no instincts in yourself, you have no material with which to work. You say: "These are instincts." Instinct is a grocer who credits all. Instinct, this is the omega of things. Evil sits in this, when you make omega alpha. You have turned the order of things. What law can we deduce from this? You need to keep this order of things: the mind – at the first place, the moral feelings – on the second, the personal feelings – on the third, the public – on the fourth, the instincts - on the fifth place. This is a pentagram. This is the man in the current manifestation. 1, 2, 3, 4, 5 - this is a manifestation of the current man. If you keep this ratio, there is a reasonable order. The forces that act help each other. Once you change the order, then there is another mathematical ratio and the task always remains unresolved. Karmic law has its origin from the first release of man from God - hence it comes. And its action or manifestation begins with the polarization of man or the appearance of the two sexes in the world. In other words: the consciousness of man has been split into two - positive and negative, ascending and descending, consciousness of love and consciousness of wisdom. These are the two poles. In each consciousness is embedded the desire to invade and conquer, it is an aspiration of every individual, of every ego, an inner urge to rule. And because this primal force has divided the human consciousness, these two poles of consciousness have been deceived. And split, they want to govern in a special way, in a mechanical way, but where this mechanical capture begins, the violence appears. All people now live in perilous times. Why? It is because self-interest is established law that pushes the entire humanity. There is no creature in the world that is not under the influence of private, individual selfishness. Therefore, every creature looks at things only from its own point of view. And when people talk about some sort of morality and law, this is relative only to their own selfishness. Rarely are met people who think truly. If you look at the world from end to end, you will see everywhere the law of violence that stems from selfishness of man. He himself creates it. For instance, the rich who tortures the poor and the poor, who is tortured and both are selfish. If you swap their places, and put in place of the poor the rich and in place of the rich the poor, you will see that they do not differ. In case you put the poor in the place of the rich with no contract, he will not even think twice and he will say that whatever the rich has is his. So now we are looking for the cause of evil in the world. Where has it come from? Very simple – it has come from the personal selfishness of man. If you get rid of it, you will enter into collective selfishness. You can collect 100, 200, 300 and more thousands of people in one place, but in this collective selfishness that exists between them, no law you can apply. Here, there is a League of Nations, but all parties, all societies that exist in the countries and they have as a general principle personal selfishness. It is the foundation. Then I bring out the law: each person is responsible for his fate. He is not responsible for what happens in the world, he cannot be the cause of it, but for the little deviation, for the small evil he has done, he is responsible. There are some side influences, but to create the least harm he is the cause. Therefore he is able to face this situation. If it was not so, then things in the world could never be fixed. For if a man cannot stand himself, then how can 10 people gathered in one place fix the world? So, the question is to the unit. So if one can not fix the world, then the second and third, and fourth, when those clever people, gather in one place will face and will be in force and to bring all mankind. Such as the beliefs in individual relations are, these will be the understandings and in collective relations. What is the important in the world? We say: one nation. We need to know what respect has the man to his family, the family what relation has to society, society what respect has to people and people what respect have to all mankind; and all mankind what relation has to space. All this is a great inner body. We take things apart. If you remove one leg out of the human body, what will happen? It has nothing. The leg itself cannot move. The leg is moving when it is connected with the body. When we are looking at a nation we cannot look it out of all the mankind. Under each nation we mean the millions of intelligences that are grouped in a Divine law, or many of these nations that make up humanity. Besides all the mankind on the Earth forms a small group. There is no sun, there are no planets; there is no part where there is no life. Everywhere there is life. The young generation needs a new way of education. If the new is not applied to it, and it will degenerate as degenerate all European nations. As persistent as these people are, they gradually degenerate. So far, the Slavs have not degenerated, but if they do not fulfill the laws of God, they will also degenerate. Violation of God's law leads to the degeneration of both the individual and of the whole societies and entire nations. It is not enough only to form a lake, but there must be constant inflow of water to be renewed. Therefore, if each day to the human mind and to the human heart does not enter one new thought and a new sense, life becomes meaningless. Life has sense when there is a communication between the souls. This shows that people are a common organism, so they have to live together. Thus, as part of the whole, no one can be absolutely free; no one can live for himself. The common law is: man has to live for society, society should live for the people; the people have to live for all the mankind. Even higher it is man to live for all the mankind. Top is man to live for God. To live for God, it is the ideal of man. If he lives on the Earth, man should have the right attitude to himself, to his home, to the community of all peoples, to all the mankind. Above all, he will have the right relations to God. Do not think that if a man has the right attitude to himself, he has solved all the issues. No, man should have a high ideal. I ask: which is the way in which we can please God? The path of service is. Until you do not learn how to serve God, you cannot find the right way. The law is: God loves all those who serve Him. Who serves only to himself, God cannot love him. To love yourself, this means that you are exposed to suffering, to serve God means to be happy. Servicing God brings life. Suffering implies that you have more self-love rather than love to the neighbor. What should the man who lives only for himself do? He should be left free to suffer the consequences of his life. You want all the people to be good to you. And they want the same. It is not bad, but everyone has to request it at first from him himself. Be kind to others, so that they be good to you. Mother is good and forgiving mistakes to her child, but not the mistakes of other people's children. If there is an item of clothing, she at first will put it on her child. This is natural. One garment she cannot put on all the children. However, she can make a garment and for each of the other children, but this is an issue that applies to all the people - barriers can be removed by the collective participation of all the people. They must come together to provide food for all. God has given enough food, but people do not distribute it evenly between them. Thanks to this create controversy. Because people are not good conductors of Divine Love, hatred is born between them. They are not good conductors and the Wisdom of God, and therefore are born and crooked and distorted thoughts. That is why I say: people themselves are the cause of their own sufferings and misfortunes. We separate from God and we want happiness. Happiness apart from God you cannot have. Once separated from God, now these external changes come. For sorrow there is a law: going out of God is grief. Return to God, it is a joy. Once you return to God, you feel limited. And you want to be free. You go out, you are free, but sorrow comes. You go to God - joy comes, but comes and limitation. You go out of God - freedom comes, but sorrow comes as well. So it is in real life. Every day we see it. It is the same law and as you get close to someone. You go to a master or a teacher. As you go, you are glad to get something, but when you go there, there is a limitation. You go to the university. As much as you are free, you still have to obey certain programs. You can do whatever you want; there is a certain order to which you must obey. And if you do not want to obey, they tell you that you should leave the university. Now many people think that when they go to God, they will be absolutely free. To be absolutely free, man has to be one with God. He should not think about himself. While you think about yourself, you are not free. For then you and God are different things. There are two people: you want and your will to be done. Then I ask: if the two wills act simultaneously, what agreement can there be? I say: we should be familiar with the basic laws of life, according to which it develops. Some people want to live happily on the Earth. It is unthinkable! Man alone cannot be happy. He is part of the whole being. Therefore he can live and be happy just being in agreement with the whole. He says: "I want to live for myself." Once you live for yourself, misfortune will come. For in happiness to yourself, you cannot anticipate all the needs of man. In the whole it can be provided. That world I call it Divine world of the whole and the human world is of the parts. Therefore, there is a world of the parts. You are a small being; you can live in this world to trust, to understand your life. "What is pleasing to God and before God the brothers dwell together in unity of the thought!" "Before God" – it means brothers and sisters to live in unity to the whole. Many say: "We live in unity." Just saying does not yet resolve the issue. We can never live in unity until everyone thinks of himself. If you think of yourself only, there will always be controversy. Then the strong shall have the right in one respect, and the weak, the collectively connected, will have another. This law exists not only in society but also in our body, ie what is happening in society, it is in our feelings, thoughts and actions. Many diseases are caused by specific understandings of the cells. When cells in the human body individualize and each says for itself that it can work as it understands, in the human body becomes anarchy. Then the doctors come - one, two, three, they make the injections, they recommend rubbings, sweats, whatever advice they do not give, but this can be reduced to the following: all the cells need to understand that they are living beings, that the happiness of each one of them depends on the general condition of the body. Therefore, the cells that live in the human body must be mutually agreed between them. If they live each one for itself they will never have the benefit of the common, the benefit of the whole. If every cell wants to live somewhere separately, as a small microbe, it will have a simple, insignificant life. I it comes to live in the human body, it will try that greatness that exists in the general harmony of the human soul. You say: "We live in unity." No, today it is not yet possible to live in unity, nor do people live in unity. Why? It is for the simple reason that all the people have different interests. Therefore, you will in no way be able to reconcile the interests of the people. For thousands of years they try to reconcile their interests, but this proves impossible. Such a law does not exist. Why? The interests of the parts can not be reconciled with each other. They can be reconciled only in the whole. Just the whole constitutes the great law of reconciliation of the interests of the parts. Therefore, anyone who deals with the parts must at first understand the law of the whole, because each part has its place in the whole and it is a part until it retains its place. If it misses this place, it is no longer a part. In life we see the same thing. How many years have been used for the creation of your hand? These knuckles show how many millions years man has lived. They show the history of mankind, the history of the human development, the state through which all the humanity has past. I would say that the human finger tells the whole history of man; you will say that this is not possible, it is romance. Yes, for the one who does not understand the laws of nature, it is so. One day I have been walking with friends in a pine forest. We have stopped in front of a pine tree and I have I said: the knees of this pine show in what years there has been more moisture and in which - less. Those knees know it. You can check this fact. When the year has had plenty of rain, the distances between those knees are higher and vice versa - when the year has been devoid of abundant rains, they are smaller. Therefore, it can be mathematically calculated and estimated, determined what the amount of moisture has been. So, thus moisture affects. Also on our bodies reflect certain events - individual, community and nation. Do you know that? We bear the sins of all the mankind. Do not think that, since we are far from Africa, we do not carry the sins of Africans. Yes, we carry them. It is time to apply the Divine teachings and between us. Design your thoughts up and fulfill God's Will. Do not think about what will happen to you – a hair will not fall out of your head without God’s will. Let all Bulgarians pray and make prayer to God. Only then Bulgaria will be blessed and free. Every nation who thinks that it would fix its works would further confuse them. If all the European nations think so, Europe will be filled with disabilities. Finally all the nations will turn to God. You might say that the responsibility lies with the government. Not so. All people, all families, all societies are responsible for the situation of their people. Every man separately is as responsible as the government is. There is an inner strength that connects people and intertwines their lives. In the future, when we are conscious of this great law, you will realize that all people should create good conditions to be able to avoid all modern ills. And not only once I have told that only the mothers are able to create that thing. Every mother when conceives a child, male or female, to say: "My daughter, my son, I want you to live in the future, in the law of love, and to represent its fullness." if she says so, she will have a daughter or a son, a hero, who will live by the law of love. Every mother should suggest this to her children. Young people, when are married, have to say this: "Our sons and daughters have to live for the love, for the God of Love, who brings people together." The new generation will be the carrier of the new ideas, of the Divine Love. And so, as we go now, if we are born in this puny way and we want to re-educate people who have worked for so many thousands of years, there is nothing we can do. Man can only be re-educated in the womb of his mother, in love. Only the mother is able to recreate the man, to reeducate him. He alone is 50% factor for its reeducation. Now you will learn to love the whole. This is a law that God will teach you. You cannot learn this law alone. Another will teach you. Who? Only a scientist can show you how to love the whole. Who is this scientist? God is. If he does not teach you, you will stay ignorant. Force without reason and goodness creates only suffering and misery. Sufferings appear as a result of clashes between thoughts, feelings and actions of people. Who does not understand this law, he seeks the causes of evil outside of himself and constantly complains; who understands this law, he knows that the causes of evil dwell in him alone. Outside of us is God who has created the world. So, if you think that evil is outside of you, you will come to the conclusion that evil is the First Cause, God. At the same, the following law exists: never a part can give its opinion on the whole; never the work of man can give its opinion about its creator. Man claiming that evil is in God; it is like the wolf complaining about the sheep that have eaten a wolf. As much as the first statement is possible, so the second is possible. It is impossible the sheep to eat the wolf. So with God there is no cause for evil. You have a false idea about God. Above all, God is not the way you imagine him. He has created the world and keeps us in mind, but he does not want to make us like Himself. "Poor man I am." You are poor for the sole reason that you want to become like God. This is a misunderstanding of life. The law is: a leaf that wants to be like the tree will ultimately fail. If it wants to become great, it will come down from the tree. If it comes down to the ground it would not be free, but it will become a laughingstock. The wind will carry it from one place to another. The leaf should stand on the tree and do its job as a leaf. If it has patience, after hundreds of years it will become as big as a tree. Therefore, if man has the patience, after years he will become like an angel. You want to be independent, independent from other people, but never want to be independent from God. Observe the following law: anyone who wants to improve should have a relationship with the whole, with God. If in you, in your mind gets the thought that you can live without him, you will come upon the greatest misfortune. If you think so, you will break your relationship with the whole. Whatever happens in the world, keep this connection! If you are rich or poor, learned or simple, whatever position to lend, keep the connection to the great center of life and do not be afraid! The law is: major rivers do not flow into the small, but small rivers always flow into the larger ones. I will express this thought in another form: small rivers flow into larger and the larger rivers spill into the small. When talking about the spill as an internal process, namely: great, powerful, strong dispenses into small. Water from the Great Ocean spills and makes countless small streams and springs. They know their origin; they know to have originated from the Pacific Ocean and want to return to it. So spill is going out and merger is coming back. Therefore some time the great will be spilled in you. Then we say: God is spilled into us and we will be back, we will tap into him. You say: "How do we tap into God? We will lose our independence, will we not? "If God is pleased to join and live in you, why not you flow and not live in it? Pour it to God, you will not get lost. As God has spilled into us, and has not lost, and when we tap into God, we will not get lost. As ever God is known in us, and we like as we tap into God, in the Divine, we will be known. And when merge in God, you will have the best conditions for development: reading, music, art - whatever you want from God, you will achieve it.